In the wake of major recent disasters such as the Indian Ocean tsunami in 2004 and Hurricane Katrina in 2005, international awareness and concern about hazards and the potential role of natural resources in reducing their impacts has grown considerably. Although natural hazards may not be stopped, the impacts of disasters often can be reduced and, in some cases, prevented. 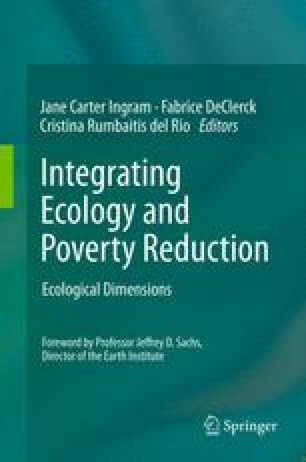 This chapter will address these issues by exploring if and how species and ecosystems may contribute to disaster risk reduction. AusAID, 2007. Indian Ocean Disaster. http://www.ausaid.gov.au, accessed January 2010.
Cooper, E., L. Burke, and N. Bood, 2009. “Coastal Capital: Belize. The Economic Contribution of Belize’s Coral Reefs and Mangroves.” WRI Working Paper. World Resources Institute, Washington, DC. 53 pp. Available online at http://www.wri.org/publications. Resilience Alliance, 2010. Key Concepts. http://www.resalliance.org/. The Natural Capital Project, 2010. http://www.naturalcapitalproject.org/home04.html. Accessed January 2010. UNISDR (United Nations International Strategy for Disaster Reduction), http://www.unisdr.org/, Accessed January 2010.